A fire pit can be the centerpiece of your camp, providing food, warmth, and good times. Add a new dimension to your camping experience with one or more of the free fire pit plans available online. Many fire pit plans available online focus on creating an outdoor fireplace for your backyard or patio. If you like to escape from the world at a vacation cabin or another permanent site, these sturdy fire pit solutions may be just what you need. You can also use these plans to enhance your camping adventures. The basic principles involved in outdoor fireplace plans can be used to construct fire pits for tent and RV camping. Even if you're building a fire pit with natural stones at a primitive campsite, you can still turn to advanced plans for suggestions on size, stone placement, and other important details. 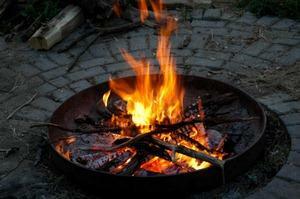 Youtubeoffers video which provides instructions for building your own fire pit. Described in straightforward terms, the pit is constructed from easy-to-obtain materials, including landscaping blocks, rebar and a grill grate. The construction is fairly easy, but you will need access to tools to help you bend the rebar to create legs for the grate. The Keep Idaho Green initiative is dedicated to preventing wildfires, and the website contains useful suggestions about setting up and using fire pits safely. The ideas for safely building and maintaining a campfire are heavy on practical tips, such as the importance of clearing grass within a five-foot radius of the pit. This site doesn't include thorough instructions for building a fire pit, but does provide helpful information for creating a functional and safe fire pit. Better Homes and Gardens approaches the project from a landscaping perspective. Six clearly-illustrated steps show how to build a durable backyard pit. This project is more time consuming than other free fire pit plans because it uses concrete in the beginning steps. The concrete must cure for a week before construction can continue. Links at the end of the article provide helpful advice on related topics, including using concrete in projects and buying patio pavers, such as those used to construct the rings of the fire pit. Browse landscaping websites and home decorating magazines for outdoor fire pit ideas. Photographs from these sources can provide inspiration for innovative new shapes and construction ideas. Before you build the perfect fire pit, make brush up on your campfire structure skills, so you can build a fire quickly and efficiently. Always use fire safely. Keep Idaho Green offers several useful suggestions for safely extinguishing fires to help prevent unfortunate accidents. The next time you go camping, you'll enjoy putting your new skills to the test by constructing a fire pit that everyone in your group will enjoy.